Northwest Independent School District (NISD) joined Hanover Research in Fall 2012 to grow the administration’s program evaluation capacity and amplify pathways and support structures in college and career readiness. 398,130 Texas students completed Advanced Placement (AP) exams in 2013. 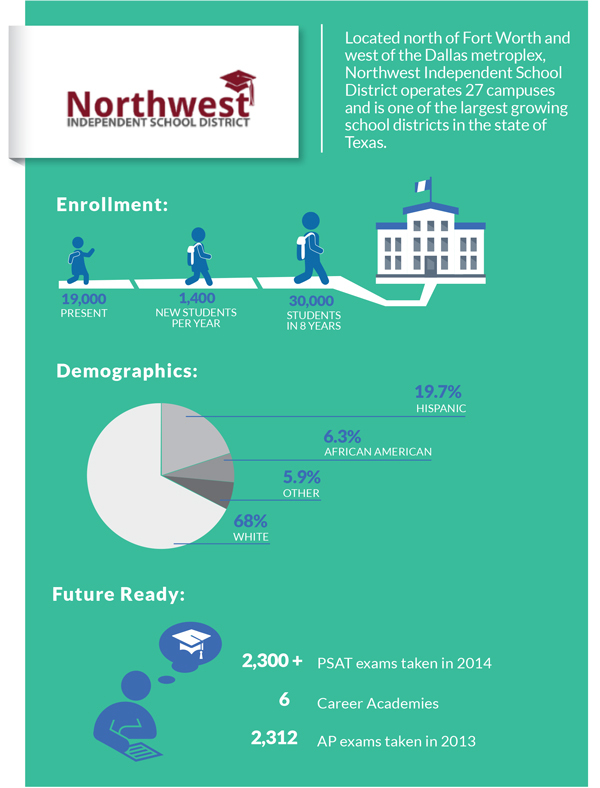 NISD students accounted for 2,312 of these exams, with 77% of NISD AP students taking one or more AP exam. When reviewing the district’s success metrics, Melissa DeSimone, NISD’s Director of Research, Assessment, & Accountability, hypothesized there was a missing link between current programming and the district’s effectiveness in enabling postsecondary student success. She also believed that an increased focus on teacher quality, vertical alignment, and professional development would serve as key components to bridge this gap. To validate this hypothesis, Melissa collaborated with Hanover to develop a research-driven college and career readiness initiative. NISD’s motto is “Every Student Future Ready,” a goal it will continue to fulfill as the college and career readiness initiative progresses. Hanover’s contributions in the first phase of this iterative research process helped the district strategize how to enhance current programming, ultimately achieved through the establishment of the Director of College & Career Readiness position. As the district is projected to grow by an additional 11,000 students within the next eight years, Kyle, Melissa, and the NISD team plan to apply Hanover’s research to inform upcoming future-readiness needs. The Benchmarking AP Scores in Texas project was a six-week request included within NISD’s year-long research partnership. All services are delivered on a fixed-fee, annual contract basis, where partners receive support on an unlimited number of projects within a sequential research queue across the contract terms.